Here is the final post in my mini series “What I Can Squeeze out of Two Gallons of Milk”. If you recall…with two gallons of raw milk, I was able to make mozzarella cheese…fresh butter…and now…ricotta cheese! I apologize for the quality of this picture. It’s…yucky looking. That’s what happens when you stick your camera inside a pot of almost boiling whey. Look closely to TRY to see that the whey is bubbly with a thick layer of white froth on the top. Can you see it? Ah well…thanks for trying. Pour your bubbling whey into a strainer lined with a tea towel. (You will put something under your strainer to catch the liquid, right?) Allow the liquid to strain through the tea towel. This takes a little manuevering because the ricotta starts to line the bottom of the tea towel and doesn’t allow the liquid to go through as easily. Use a spoon and scrape all the ricotta off of the tea towel. 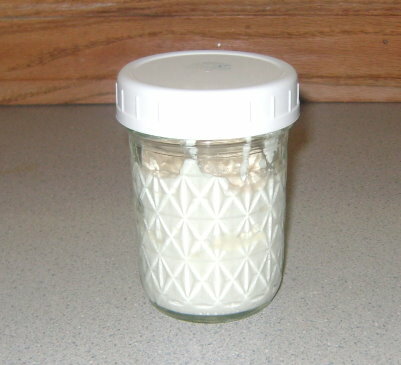 Place your ricotta cheese into a jar for storage. Stuffed Manicotti anyone? So, what do you think? Not too hard, huh? What recipes do you like making with ricotta cheese? Here’s what I need you to do now. Tell me what you’d like for me to talk about next in the Feeding the Family series! Thanks! This post is linked to Frugal Fridays. I can’t wait to try all of this. Thanks! In a medium bowl, stir the ricotta and 2 Ts of cream. In a mixer, beat the remaining cream (again, you might want to start with less) with the powdered sugar and cinnamon until semi-firm peaks form. You can make this up to 4 hours ahead, and refrigerate. Serve with fruit (I’m thinking strawberries!) and enjoy! Actually, my husband likes this so much he eats it without fruit, like pudding, LOL! Neat! I didn’t know that there was ricotta in my whey! I always think of making lasagna. It was fun trying to make it in Russia without all of the packaged ingredients we have here. I ended up buying “villiage cheese” to use for ricotta. I think it probably was made the same way, just with a Russian name. Thank you for the very clear directions. This looks like something that our family could have fun doing! A friend suggested I check out your blog. It’s wonderful to find another blog, dedicated to homemaking. I have four children as well – 3 boys and 1 girl, ages 2-9. We also eat via Nourishing Traditions and cooking from scratch, we homeschool, and are learning how to homestead. I am planting my first veggie garden late next month, after the last frost. I’ll be “green manuring” this weekend. So do you use that last bit of whey then? I read online recently that you can use the whey instead of water or milk in homemade breads. It can also be used to soak grains or beans. It’s nothing I’ve tried, but I’m just curious. Gosh, your series is so tempting. I sure wish I had a way to get my hands on raw milk! I was wondering about the whey, too (or what’s left of it). I’ve read to use it in pancakes and waffles and other breadish stuff calling for milk, though it’s been a while since I’ve made ricotta. (My way is a bit different.) I wonder too about soaking with it, although since I’ve not used raw milk, I don’t know that the stuff I’ve had left over would have the “good stuff” left for soaking. PS – the little one turned 2 this week! I just polished off a piece of Lemon Blueberry cormeal cake made with ricotta cheese and whole wheat pastry flour!!! Yahoooo- I will post recipe later this weekend on my blog IF the cake lasts long enough to get a nice picture. Thanks for your recipe! You can tak about anything on your next post- I love all your ideas!! Hello! Just wanted you to know that I linked to this post at http://joyfulmelody519.blogspot.com/2009/07/exciting-new-ventures.html ! I love your posts :) They are so helpful! I know this is an old post, but I was wondering if you could use the whey from cream cheese for this? Thanks for all you teach us! It seems like I’ve tried it before without great results. I think one problem is that the amount of ricotta you get from whey is quite small and since the amount of whey from the cream cheese is small…it wouldn’t really give much ricotta if any. I realize this will be old at this point, but depending what state you live in you might want to check your local farms for raw milk. We have a farm here in Vermont and we can sell our raw milk as long as people come to the farm to get it. We also sell eggs, both organic. WOW! I got so many helpful tips today from you and others on your site that I feel like a new person. Now I know how to make cheeses, soak grain/flour (which I NEVER knew), found out there are great things that one can plant for keeping chickens fed instead of buying expensive grains. THANKS TO ALL who contribute their good ideas! I feel shabby because I don’t have anything to contribute at this time. But, I am going to have a blog about gardening and container gardening (soon, I hope)so maybe I can share that with y’all. Thanks again! I didn’t get any ricotta out of my whey either Doug. Does anyone know what causes this to happen so that I can get ricotta next time I make mozzerella cheese. Do you need to let the whey cool before straining? Any suggestions? No, it just works sometimes and othertimes it doesn’t. I wish I understood better myself! I didn’t get any ricotta out of my whey. Maybe I didn’t get the whey as hot as I should have?? I saw the fine grains of the ricotta but only a tiny bit stuck to the cloth when strained. I wish I knew – sometimes it works – sometimes it doesn’t. I’m not sure why. Same problem here. I got such a tiny amount. Maybe a tsp! Wonder what I did wrong? Sometimes it works – sometimes it doesn’t. I’m not sure why. Same here :( I didn’t get any ricotta from my whey after I made mozza as well…any suggestions? I wish I knew. Sometimes it works – sometimes it doesn’t. I’m not sure why. I made the ricotta from the whey as directed…end result was approx. 2 TBSP of ricotta..what did I do wrong? Is the leftover still whey? I’m wondering if I can use it to lacto ferment. Yes, I believe it would still work to lacto ferment after this process! The recipe I use calls for letting the whey get acidic before making it. You set it out for 12-24 hours. I used the various whey from different cheese making (about 1.5 gallons worth of milk) and got about 1 cup. I also heat it up a little more 220 degrees. I wanted to chime in since my yield was pretty good and results more sure. Debra, thanks for your tip– I too got no ricotta from my whey, but I still have about half of it saved in a pot, so I’ll try your way tomorrow with what’s left! AWESOME I’m so excited that it worked. I still have my mozz hanging but the ricotta turned out great. I was really unsure if it was going to turn out at all after I heated it but once I drained I got a very full cup of ricotta, that tastes awesome!!!! I just wanted to chime in here. I have made mozzarella four times now and when I heat the whey to make ricotta I add in a “glug” of vinegar while it’s heating up. I think it helps in the ricotta process. I am no professional (or even close) but if some of you are not getting your ricotta to form maybe worth a shot. Also cheesecloth needs to be the good stuff not the stuff from the grocery store, or tea towel works awesome too! I nursed my kids til 3 or 4 (had 3). I even tandem nursed almost a year. Switched to raw goats milk. I had 3 la mancha does. Also raised a couple pigs on left over milk. Eventually they all passed away :(. I located raw cows milk and they drank that. We were never huge milk drinkers. My children are grown now and we pretty much switched to alternative “Milk”. Well, just recently I started buying fresh raw milk again. It’s been wonderful!! I make great yogurt, ice cream etc. I lost touch with making cheeses and stuff. Thank you for your recipes.I can’t wait to get started on my cheeses again!